This tool lets you make your own custom prescriptions. Fill in the details below and press the "Make the prescription!" button. 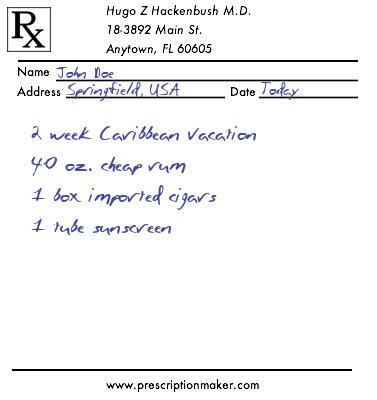 Your custom prescription will be shown (containing the text that you entered) in the space above. What should you put in your custom prescription? It's up to you! The only limit is your imagination. Keep in mind, however, that this is for entertainment purposes. Pharmacists are smart and will laugh long and hard at you if you try to give them one of these!